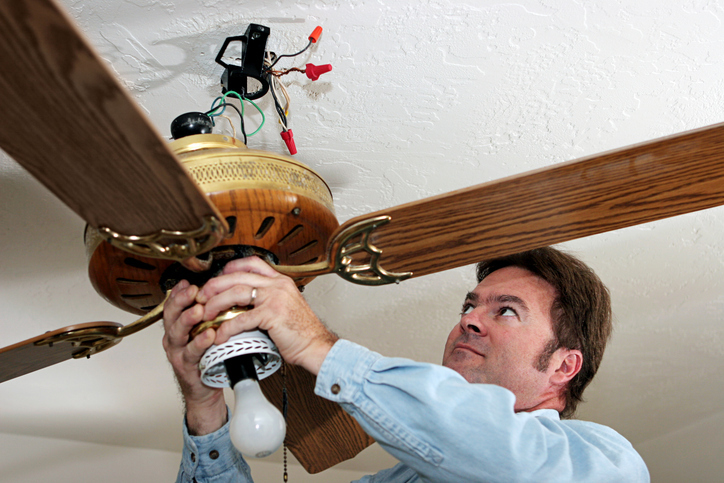 Ceiling fan installation is a commonly requested service here at TriStar Electric, along with repairs and replacements. We know the importance of having a working fan for proper air circulation and, depending on the fan, reliable lighting. That’s why we follow through on each project to make sure everything is in good working order, no matter how many times we have to come back! An issue we sometimes encounter is when a fan is installed by another company and is not working correctly. Here is an example of a similar challenge presented to us, and how we were able to fix it and delight our customer. A customer came to us with a problem: they had their ceiling fan installation done by another company, and shortly after the fan began having issues. They had purchased their fan from a store and asked that store for recommendations of an electrician to have it fixed. They recommended us, and we were happy to help with the challenge! It took a few tries to get it working correctly, but our knowledgeable electricians were able to fix the wiring and get it working correctly. We even took a look at the other fans to make sure they had no problems. This left the customer thrilled with our services, and they even left a great review for us! This entry was posted on Friday, May 20th, 2016 at 7:20 pm. Both comments and pings are currently closed.